“I’m not sure there is a better indicator of economic health than patent activity," says Polsinelli's Adam Rehm. Here's what North Texas is inventing. There is no single economic indicator or milestone that can decisively be called the lifeblood of innovation, but patents and patent activity are a good starting point. 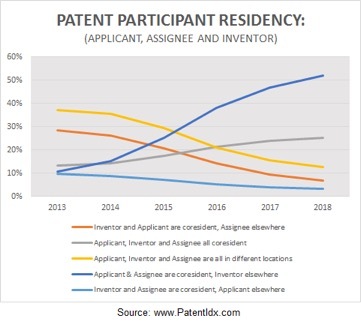 “Patents are a great way to measure innovation, especially with respect to geographic areas and companies and individuals residing in these areas,” said Adam Rehm, a Polsinelli PC shareholder. Rehm is a patent attorney and former U.S. Patent Examiner with more than 15 years of experience preparing and prosecuting patent applications. He said the relationship between inventors and their companies is symbiotic, stating in many cases inventors couldn’t have conceived of their inventions without the company and vice versa. “While inventors commonly move from one company to another and continue to invent, the companies will continue to innovate and file patent applications using the tools they’re providing to other inventors. Thus, both the inventors and the company are properly recognized as innovative,” Rehm said. On Nov. 9, 2015, the United States Patent and Trademark Office opened its Texas Regional Office in downtown Dallas. Hundreds of cities apply for USPTO regional offices according to Hope Shimabuku, regional director of the Texas Regional USPTO. Dallas had several factors that led it to being chosen for the office. A key factor was technology and innovation in North Texas and the potential for ongoing growth, and because the tech ecosystem was robust it offered the USPTO a readily available workforce with a tech background. Shimabuku said 80 percent of the USPTO’s workforce needs to have a hard science such as engineering and computer science to serve as a patent examiner. 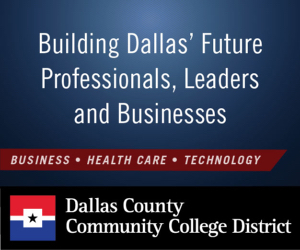 “[Dallas] is a great place for us to be able to put an office that is really looking for innovation and seeking those innovators and technology companies to be a part of our innovation ecosystem,” she said. Dallas-Fort Worth ranked No. 11 in patent production, out of 250 metros. Patents granted include Apple’s data function within an access gateway node; Dell’s credential sharing system including a pre-boot authentication; Daifuku’s automatic truck unloading robot; and IBM’s smart garment, such as a shirt, that identifies user changes. 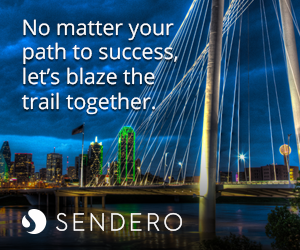 Having an office in Dallas is a benefit for local businesses, entrepreneurs, and inventors for a number of reasons. The most obvious is the office has experts in patents and trademarks including its examiners, supervisors, and managers available to answer questions and walk people through the patent process. The office offers classes on-site, too. For inventors already into the patent process, Shimabuku said there is a benefit to coming into the office and meeting with examiners face-to-face rather than relying solely on virtual contact by phone or online. She said an in-person meeting can help move a patent forward. Inventors also can conduct oral hearing appeals for patents in front of judges locally rather than having to travel to the USPTO headquarters in Alexandria, Virginia. Another benefit is people can perform patent and trademark searches using the same software tools used by USPTO examiners. Shimabuku said this search tool pulls up to two-times the patent references compared to a Google patent search. These tools also are available in 80 libraries across the U.S. including the Dallas Public Library as part of the Patent and Trademark Resource Center Association, which trains librarians in the basics of intellectual property. Technology and innovation are priorities for the USPTO. The organization does stakeholder visits with leading edge companies and invites companies, groups, and individuals to visit the office. Do patent analytics mash up with other economic data and serve as a proxy for the innovative spirit of a region? And, are patents more than a proxy measure serving as a driver that encourages economic growth? Those are two questions asked by Joe Chiarella, owner and publisher of Patent Index LLC. Chiarella comes to patent research from three related areas: He has evaluated intellectual property portfolios for investors and found the USPTO website “difficult and daunting” as a user, he is an entrepreneur active in economic development in his home region, and he just found the patent process interesting. To facilitate his research, as of this writing, the Patent Index database holds of 3.5 million U.S. patents, as well as a wide assortment of economic, geographic, and demographic data — that’s more than 3 billion facts, Chiarella said. A challenge in patent research is a USPTO patent application includes the city, state, and country of four groups (and possibly more than one person within each group): named inventors, named applicants, named assignees (patent owners), and a named patent attorney/agent and/or a patent law firm. Beyond the basic information provided on the application, understanding patent activity within a geographic region, such as North Texas, also requires another level of data. First, that entire area has to be defined. Chiarella said the U.S. Department of Commerce classifies the Dallas-Forth Worth-Arlington (DFWA) area including a total of 157 city locations. A larger challenge is the fact that companies are geographically disperse. The applicant, inventor, and assignee on any given U.S. patent are in the same metropolitan area, such as DFWA, only 18 percent of the time per Patent Index data. Companies are geographically disperse: The applicant, inventor, and assignee on a patent are all resident in the same metropolitan area about 18 percent of the time. 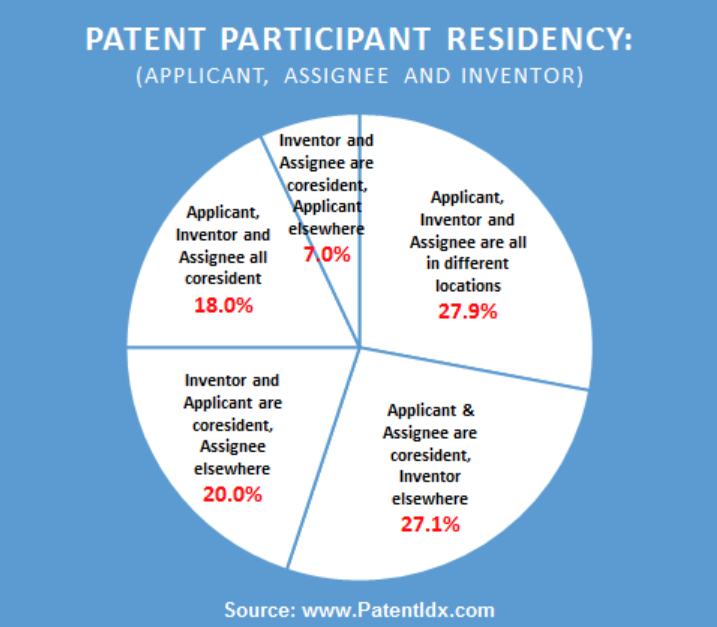 This breakdown for all of the U.S. illustrates participant residency based on U.S. patents with U.S.-based companies, for the 5.5 years from January 2013 to July 2018. He underscored two related trends that serve to lessen the role of the inventor in patent reporting. Geographically, the trend is toward the applicant and assignee being in the same metropolitan area while the inventor is located elsewhere. Another trend that is a growing convention is where the assignee (the owner of the patent and often a company) also is registered as the applicant, where the previous norm was for the inventor to be registered as the applicant. HOW DOES NORTH TEXAS MEASURE UP? Comparing the U.S. data to DFWA patent data, locally having all three parties co-resident is 13.3 percent (compared to 18 percent across the U.S.) and all three parties in different locations is 31 percent (27.9 percent nationally). 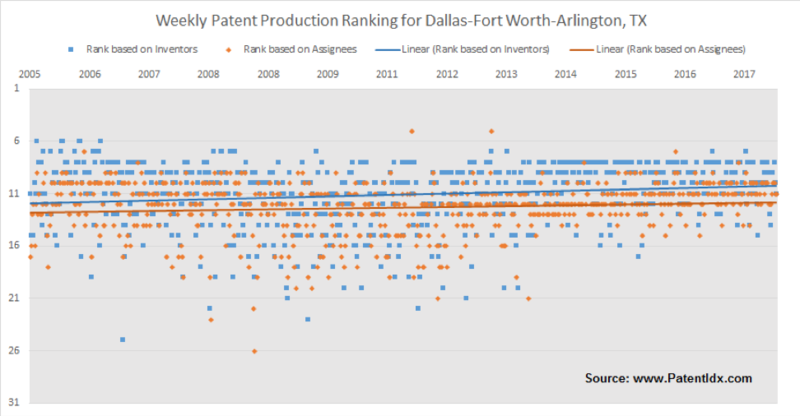 These numbers don’t indicate any sort of problem, but do highlight the challenge in uncovering every patent that has a North Texas tie. North Texas is rising in the national rankings. This chart plots the relative weekly ranking of the Dallas-Fort Worth-Arlington metro area. The ranks are relative to the top 250 US metros and are based on the number of patents attributed to inventors in the region and attributed to assignees (companies) in the region – for the given week. When taking all of these data points into consideration for the top 250 metro areas in the U.S. based on the number of patents attributed to both inventors and assignees (companies) in the regions, Patent Index has found DFWA is on the rise. Going back to 2005, the region’s weekly rank ranged widely between sixth and 20th in the U.S. Starting in 2012, the rankings began both rising and tightening to where the inventor-based rank was more consistently eighth or ninth week-to-week and the assignee ranking 11th or 12th, and both exhibiting fewer dips below 15th. The indicator is companies both in and out of the DFWA region are tapping inventors within North Texas to produce patents, Chiarella said. So what is North Texas inventing? Between 2013-2017, wireless communication networks was the fastest-growing patent class and the second largest class by volume. 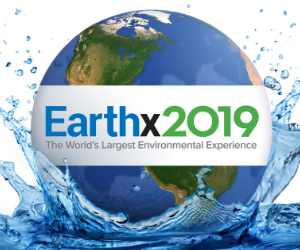 Rounding out the top five include earth or rock drilling, semiconductor devices, pictorial communication (TVs), and electric conversion apparatuses. Anecdotally, the USPTO’s Shimabuku said during outreach events and corporate visits she has seen a “lot of focus” on virtual reality and artificial intelligence, two areas of leading-edge tech. Here’s a list of patents sorted by “slope” for the five years 2013-2017 (because 2018 is not yet complete). This table shows the top 10 fastest-growing patent portfolios for art class H04W. Patents aren’t the only measure of innovation, Chiarella said. He pointed out that in online services there’s a trend for companies and entrepreneurs to not file for patent protection because they can keep their code behind a firewall as a trade secret. He said this is one reason, among others, why patents alone aren’t a complete indicator of vitality in the innovation economy. He added patents remain an important indicator though. Even if some online innovators are eschewing the traditional patent process, there is still value in protecting intellectual property on a conceptual level even if the code can be held as a trade secret, and according to Polsinelli PC’s Rehm patents remain a great way to measure innovation.